Nvidia Corporation (/ɛnˈvɪdiə/ en-VID-ee-ə), more commonly referred to as Nvidia (stylized as NVIDIA), is an American technology company incorporated in Delaware and based in Santa Clara, California. It designs graphics processing units (GPUs) for the gaming and professional markets, as well as system on a chip units (SoCs) for the mobile computing and automotive market. Its primary GPU product line, labeled "GeForce", is in direct competition with Advanced Micro Devices' (AMD) "Radeon" products. Nvidia expanded its presence in the gaming industry with its handheld Shield Portable, Shield Tablet and Shield Android TV. Since 2014, Nvidia has shifted to become a platform company focused on four markets – gaming, professional visualization, data centers and auto. Nvidia is also now focused on artificial intelligence. In addition to GPU manufacturing, Nvidia provides parallel processing capabilities to researchers and scientists that allow them to efficiently run high-performance applications. They are deployed in supercomputing sites around the world. More recently, it has moved into the mobile computing market, where it produces Tegra mobile processors for smartphones and tablets as well as vehicle navigation and entertainment systems. In addition to AMD, its competitors include Intel, Qualcomm and Arm (e.g., because of Denver, while Nvidia also licenses Arm's designs). 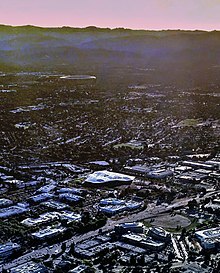 Aerial view of the new Nvidia headquarters building and surrounding campus and area in Santa Clara, California, in 2017. Apple Park is visible in the distance. In the early 1990s, the three co-founders hypothesized that the proper direction for the next wave of computing would be accelerated or graphics based. They believed that this model of computing could solve problems that general-purpose computing fundamentally couldn't. They also observed that video games were some of the most computationally challenging problems, but would have incredibly high sales volume. With a capital of $40,000, the company was born. The company initially had no name and the co-founders named all their files NV, as in "next version". The need to incorporate the company prompted the co-founders to review all words with those two letters, leading them to "invidia", the Latin word for "envy". The company received $20 million of venture capital funding from Sequoia Capital and others. The release of the RIVA TNT in 1998 solidified Nvidia's reputation for developing capable graphics adapters. In late 1999, Nvidia released the GeForce 256 (NV10), most notably introducing on-board transformation and lighting (T&L) to consumer-level 3D hardware. Running at 120 MHz and featuring four pixel pipelines, it implemented advanced video acceleration, motion compensation and hardware sub-picture alpha blending. The GeForce outperformed existing products by a wide margin. Due to the success of its products, Nvidia won the contract to develop the graphics hardware for Microsoft's Xbox game console, which earned Nvidia a $200 million advance. However, the project took many of its best engineers away from other projects. In the short term this did not matter, and the GeForce2 GTS shipped in the summer of 2000. In December 2000, Nvidia reached an agreement to acquire the intellectual assets of its one-time rival 3dfx, a pioneer in consumer 3D graphics technology leading the field from mid 1990s until 2000. The acquisition process was finalized in April 2002. In July 2002, Nvidia acquired Exluna for an undisclosed sum. Exluna made software rendering tools and the personnel were merged into the Cg project. In August 2003, Nvidia acquired MediaQ for approximately US$70 million. On April 22, 2004, Nvidia acquired iReady, also a provider of high performance TCP/IP and iSCSI offload solutions. In December 2004, it was announced that Nvidia would assist Sony with the design of the graphics processor (RSX) in the PlayStation 3 game console. On December 14, 2005, Nvidia acquired ULI Electronics, which at the time supplied third-party southbridge parts for chipsets to ATI, Nvidia's competitor. In March 2006, Nvidia acquired Hybrid Graphics. In December 2006, Nvidia, along with its main rival in the graphics industry AMD (which had acquired ATI), received subpoenas from the U.S. Department of Justice regarding possible antitrust violations in the graphics card industry. Forbes named Nvidia its Company of the Year for 2007, citing the accomplishments it made during the said period as well as during the previous five years. On January 5, 2007, Nvidia announced that it had completed the acquisition of PortalPlayer, Inc. In February 2008, Nvidia acquired Ageia, developer of the PhysX physics engine and physics processing unit. Nvidia announced that it planned to integrate the PhysX technology into its future GPU products. In July 2008, Nvidia took a write-down of approximately $200 million on its first-quarter revenue, after reporting that certain mobile chipsets and GPUs produced by the company had "abnormal failure rates" due to manufacturing defects. Nvidia, however, did not reveal the affected products. In September 2008, Nvidia became the subject of a class action lawsuit over the defects, claiming that the faulty GPUs had been incorporated into certain laptop models manufactured by Apple Inc., Dell, and HP. In September 2010, Nvidia reached a settlement, in which it would reimburse owners of the affected laptops for repairs or, in some cases, replacement. On January 10, 2011, Nvidia signed a six-year, $1.5 billion cross-licensing agreement with Intel, ending all litigation between the two companies. In November 2011, after initially unveiling it at Mobile World Congress, Nvidia released its Tegra 3 ARM system-on-chip for mobile devices. Nvidia claimed that the chip featured the first-ever quad-core mobile CPU. In May 2011, it was announced that Nvidia had agreed to acquire Icera, a baseband chip making company in the UK, for $367 million. In January 2013, Nvidia unveiled the Tegra 4, as well as the Nvidia Shield, an Android-based handheld game console powered by the new system-on-chip. On July 29, 2013, Nvidia announced that they acquired PGI from STMicroelectronics. On May 6, 2016, Nvidia unveiled the first GeForce 10 series GPUs, the GTX 1080 and 1070, based on the company's new Pascal microarchitecture. Nvidia claimed that both models outperformed its Maxwell-based Titan X model; the models incorporate GDDR5X and GDDR5 memory respectively, and use a 16 nm manufacturing process. The architecture also supports a new hardware feature known as simultaneous multi-projection (SMP), which is designed to improve the quality of multi-monitor and virtual reality rendering. Laptops that include these GPUs and are sufficiently thin – as of late 2017, under 0.8 inches (20 mm) – have been designated as meeting Nvidia's "Max-Q" design standard. In July 2016, Nvidia agreed to a settlement for a false advertising lawsuit regarding its GTX 970 model, as the models were unable to use all of their advertised 4 GB of RAM due to limitations brought by the design of its hardware. In May 2017, Nvidia announced a partnership with Toyota Motor Corp. Toyota will use Nvidia's Drive PX-series artificial intelligence platform for its autonomous vehicles. In July 2017, Nvidia and Chinese search giant Baidu, Inc. announced a far-reaching AI partnership that includes cloud computing, autonomous driving, consumer devices, and Baidu's open-source AI framework PaddlePaddle. Baidu unveiled that Nvidia 's Drive PX 2 AI will be the foundation of its autonomous-vehicle platform. Nvidia officially released the NVIDIA TITAN V on December 7, 2017. Nvidia officially released the Nvidia Quadro GV100 on March 27, 2018. Nvidia officially released RTX 2080GPUs September 27, 2018. In 2018, Google announced that Nvidia's Tesla P4 graphic cards would be integrated into Google Cloud service's artificial intelligence. On 11 March 2019, Nvidia announced a deal to buy Mellanox Technologies for $6.9 billion to substantially expand its footprint in the high-performance computing market. For the fiscal year 2018, Nvidia reported earnings of US$3.047 billion, with an annual revenue of US$9.714 billion, an increase of 40.6% over the previous fiscal cycle. Nvidia's shares traded at over $245 per share, and its market capitalization was valued at over US$120.6 billion in September 2018. NVIDIA’s GPU Technology Conference (GTC) is a series of technical conferences held around the world. It originated in 2009 in San Jose, California, with an initial focus on the potential for solving computing challenges through GPUs. In recent years, the conference focus has shifted to various applications of artificial intelligence and deep learning, including: self-driving cars, healthcare, high performance computing, and NVIDIA Deep Learning Institute (DLI) training. GTC 2018 attracted over 8400 attendees. Nvidia Drive automotive solutions, a range of hardware and software products for assisting car drivers. The Drive PX-series is a high performance computer platform aimed at autonomous driving through deep learning, while Driveworks is an operating system for driverless cars. Until September 23, 2013, Nvidia had not published any documentation for its hardware, meaning that programmers could not write free and open-source device driver for its products without resorting to (clean room) reverse engineering. Instead, Nvidia provides its own binary GeForce graphics drivers for X.Org and an open-source library that interfaces with the Linux, FreeBSD or Solaris kernels and the proprietary graphics software. Nvidia also provided but stopped supporting an obfuscated open-source driver that only supports two-dimensional hardware acceleration and ships with the X.Org distribution. The proprietary nature of Nvidia's drivers has generated dissatisfaction within free-software communities. Some Linux and BSD users insist on using only open-source drivers and regard Nvidia's insistence on providing nothing more than a binary-only driver as inadequate, given that competing manufacturers such as Intel offer support and documentation for open-source developers and that others (like AMD) release partial documentation and provide some active development. Because of the closed nature of the drivers, Nvidia video cards cannot deliver adequate features on some platforms and architectures given that the company only provides x86/x64 and ARMv7-A driver builds. As a result, support for 3D graphics acceleration in Linux on PowerPC does not exist, nor does support for Linux on the hypervisor-restricted PlayStation 3 console. Some users claim that Nvidia's Linux drivers impose artificial restrictions, like limiting the number of monitors that can be used at the same time, but the company has not commented on these accusations. Nvidia GPUs are used in deep learning, artificial intelligence, and accelerated analytics. The company developed GPU-based deep learning in order to use artificial intelligence to approach problems like cancer detection, weather prediction, and self-driving vehicles. They are included in all Tesla vehicles. The purpose is to help networks learn to “think”. According to TechRepublic, Nvidia GPUs "work well for deep learning tasks because they are designed for parallel computing and do well to handle the vector and matrix operations that are prevalent in deep learning". These GPUs are used by researchers, laboratories, tech companies and enterprise companies. In 2009, Nvidia was involved in what was called the "big bang" of deep learning, "as deep-learning neural networks were combined with Nvidia graphics processing units (GPUs)". That year, the Google Brain used Nvidia GPUs to create Deep Neural Networks capable of machine learning, where Andrew Ng determined that GPUs could increase the speed of deep-learning systems by about 100 times. In April 2016, Nvidia produced the DGX-1 supercomputer based on an 8 GPU cluster, to improve the ability of users to use deep learning by combining GPUs with integrated deep learning software. It also developed Nvidia Tesla K80 and P100 GPU-based virtual machines, which are available through Google Cloud, which Google installed in November 2016. Microsoft added GPU servers in a preview offering of its N series based on Nvidia's Tesla K80s, each containing 4992 processing cores. Later that year, AWS's P2 instance was produced using up to 16 Nvidia Tesla K80 GPUs. That month Nvidia also partnered with IBM to create a software kit that boosts the AI capabilities of Watson, called IBM PowerAI. Nvidia also offers its own NVIDIA Deep Learning software development kit. In 2017, the GPUs were also brought online at the RIKEN Center for Advanced Intelligence Project for Fujitsu. The company's deep learning technology led to a boost in its 2017 earnings. In May 2018, researchers at the artificial intelligence department of Nvidia realized the possibility that a robot can learn to perform a job simply by observing the person doing the same job. They have created a system that, after a short revision and testing, can already be used to control the universal robots of the next generation. In addition to GPU manufacturing, Nvidia provides parallel processing capabilities to researchers and scientists that allow them to efficiently run high-performance applications. Nvidia's Inception Program was created to support startups making exceptional advances in the fields of AI and Data Science. Award winners are announced at Nvidia's GTC Conference. There are currently 2,800 startups in the Inception Program. ^ a b c d e f "Annual Report (Form 10-K)" (PDF). Retrieved March 17, 2018. ^ "NVIDIA Logo Guidelines at a Glance" (PDF). NVIDIA.com. NVIDIA. Retrieved March 21, 2018. ^ "NVIDIA Corporation - Investor Resources - FAQs". investor.nvidia.com. ^ Freund, Karl (November 17, 2016). "NVIDIA Is Not Just Accelerating AI, It Aims To Reshape Computing". Forbes. Retrieved February 11, 2017. ^ Clark, Don (August 4, 2011). "J.P. Morgan Shows Benefits from Chip Change". WSJ Digits Blog. Retrieved September 14, 2011. ^ "Top500 Supercomputing Sites". Top500. Retrieved September 14, 2011. ^ Burns, Chris. "2011 The Year of Nvidia dominating Android Superphones and tablets". SlashGear. Retrieved September 14, 2011. ^ "Tegra Super Tablets". Nvidia. Retrieved September 14, 2011. ^ "Tegra Super Phones". Nvidia. Retrieved September 14, 2011. ^ Nusca, Andrew (November 16, 2017). "This Man Is Leading an AI Revolution in Silicon Valley—And He's Just Getting Started". Fortune. Archived from the original on November 16, 2017. Retrieved November 28, 2017. ^ "Company Info". Nvidia.com. Retrieved November 9, 2010. ^ "Jensen Huang: Executive Profile & Biography". Bloomberg News. Retrieved June 21, 2018. ^ Williams, Elisa (April 15, 2002). "Crying wolf". Forbes. Retrieved February 11, 2017. Huang, a chip designer at AMD and LSI Logic, cofounded the company in 1993 with $20 million from Sequoia Capital and others. ^ Perez, Derek; Hara, Michael (December 15, 2000). "NVIDIA to Acquire 3dfx Core Graphics Assets" (Press release). Santa Clara, CA. Retrieved January 23, 2017. ^ Kanellos, Michael (April 11, 2002). "NNvidia buys out 3dfx graphics chip business". CNET. Retrieved January 23, 2017. ^ Becker, David. "Nvidia buys out Exluna". News.cnet.com. Retrieved November 9, 2010. ^ "NVIDIA Completes Purchase of MediaQ". Press Release. NVIDIA Corporation. August 21, 2003. Retrieved August 21, 2016. ^ "NVIDIA Announces Acquisition of iReady". Press Release. NVIDIA Corporation. April 22, 2004. Retrieved August 21, 2016. ^ "NVIDIA to Acquire ULi Electronics, a Leading Developer of Core Logic Technology". Press Release. NVIDIA Corporation. December 14, 2005. Retrieved August 21, 2016. ^ Smith, Tony (March 22, 2006). "Nvidia acquires Hybrid Graphics - Middleware purchase". Hardware. The Register. Retrieved August 21, 2016. ^ Krazit, Tom; McCarthy, Caroline (December 1, 2006). "Justice Dept. subpoenas AMD, Nvidia". New York Times. Archived from the original on December 8, 2006. ^ Brian Caulfield (January 7, 2008). "Shoot to Kill". Forbes. Retrieved December 26, 2007. ^ "Nvidia acquires PortalPlayer". Press Release. NVIDIA Corporation. January 5, 2007. Retrieved August 21, 2016. ^ "Nvidia to acquire Ageia for the PhysX chip". CNET. Retrieved May 26, 2017. ^ "Did NVIDIA cripple its CPU gaming physics library to spite Intel?". Ars Technica. Retrieved May 26, 2017. ^ "Nvidia GPU Class-Action Settlement Offers Repairs, New Laptops". PC Magazine. Retrieved May 26, 2017. ^ "Update: Nvidia Says Older Mobile GPUs, Chipsets Failing". ExtremeTech. Retrieved May 26, 2017. ^ "Intel agrees to pay NVIDIA $1.5b in patent license fees, signs cross-license". Engadget. Retrieved May 26, 2017. ^ "Nvidia Tegra 3: what you need to know". Techradar. Retrieved May 26, 2017. ^ "Nvidia Quad Core Mobile Processors Coming in August". PC World. Retrieved February 15, 2011. ^ "Cambridge coup as Icera goes to Nvidia for £225m". Business Weekly. May 9, 2011. Retrieved May 10, 2011. ^ "Nvidia announces Project Shield handheld gaming system with 5-inch multitouch display, available in Q2 of this year". The Verge. Retrieved May 26, 2017. ^ "NVIDIA Pushes Further into HPC With Portland Group Acquisition - insideHPC". insideHPC. July 29, 2013. Retrieved August 25, 2017. ^ "Nvidia's new graphics cards are a big deal". The Verge. Retrieved May 26, 2017. ^ Mark Walton (May 7, 2016). "Nvidia's GTX 1080 and GTX 1070 revealed: Faster than Titan X at half the price". Ars Technica. ^ Joel Hruska (May 10, 2016). "Nvidia's Ansel, VR Funhouse apps will enhance screenshots, showcase company's VR technology". ExtremeTech. ^ Crider, Michael (October 5, 2017). "What Are NVIDIA MAX-Q Laptops?". How-To Geek. Retrieved December 18, 2017. ^ Smith, Ryan. "Update: NVIDIA GeForce GTX 970 Settlement Claims Website Now Open". Anandtech. Purch, Inc. Retrieved November 15, 2016. ^ Alexandria Sage (May 10, 2017). "Nvidia says Toyota will use its AI technology for self-driving cars". Reuters. ^ "Nvidia and Baidu join forces in far reaching AI partnership". ^ Newsroom, NVIDIA. "NVIDIA TITAN V Transforms the PC into AI Supercomputer". NVIDIA Newsroom Newsroom. ^ "Introducing NVIDIA TITAN V: The World's Most Powerful PC Graphics Card". NVIDIA. ^ "Google Cloud gets support for Nvidia's Tesla P4 inferencing accelerators". Tech Crunch. Retrieved August 30, 2018. ^ "Nvidia to acquire Mellanox Technologies for about $7 billion in cash". www.cnbc.com. March 11, 2019. Retrieved March 11, 2019. ^ a b "NVIDIA Corporation – Financial Info – Annual Reports and Proxies". investor.nvidia.com. Retrieved November 18, 2018. ^ a b "GPU Technology Conference". GPU Technology Conference. Retrieved June 13, 2018. ^ "Company History | NVIDIA". www.nvidia.com. Retrieved June 13, 2018. ^ "Deep Learning and GPU-Programming Workshops at GTC 2018". NVIDIA. Retrieved June 13, 2018. ^ "Nvidia automotive solutions". Nvidia. Retrieved March 29, 2016. ^ "Nvidia unveils driverless car OS and partnership with TomTom". September 29, 2016. Retrieved October 20, 2016. ^ "Nvidia Offers to Release Public Documentation on Certain Aspects of Their GPUs". September 23, 2013. Retrieved September 24, 2013. ^ "nv". Retrieved August 6, 2015. ^ "Linus Torvalds: 'Damn You, Nvidia' for not Supporting Linux". The Verge. June 17, 2012. Retrieved July 9, 2013. ^ "X.org, distributors, and proprietary modules". Linux Weekly News. Eklektix. August 14, 2006. Retrieved November 3, 2008. ^ "Unix Drivers". Retrieved August 6, 2015. ^ Kevin Parrish. "Nvidia Removed Linux Driver Feature Due to Windows". Tom's Hardware. Retrieved August 6, 2015. ^ Jr, Berkeley Lovelace (February 10, 2017). "Cramer on AI: 'This is the replacement of us. We don't need us with Nvidia'". ^ Markman, Jon. "Deep Learning, Cloud Power Nvidia". ^ Strategy, Moor Insights and. "A Machine Learning Landscape: Where AMD, Intel, NVIDIA, Qualcomm And Xilinx AI Engines Live". ^ "Google Cloud adds NVIDIA Tesla K80 GPU support to boost deep learning performance - TechRepublic". ^ "Intel, Nvidia Trade Shots Over AI, Deep Learning". ^ "Nvidia CEO bets big on deep learning and VR". April 5, 2016. ^ "From not working to neural networking". ^ Coldewey, Devin. "NVIDIA announces a supercomputer aimed at deep learning and AI". ^ 21:07, 21 February 2017 at; tweet_btn(), Shaun Nichols. "Google rents out Nvidia Tesla GPUs in its cloud. If you ask nicely, that'll be 70 cents an hour, bud". ^ "IBM, NVIDIA partner for 'fastest deep learning enterprise solution' in the world - TechRepublic". ^ "IBM and Nvidia team up to create deep learning hardware". November 14, 2016. ^ "IBM and Nvidia make deep learning easy for AI service creators with a new bundle". November 15, 2016. ^ "Facebook 'Big Basin' AI Compute Platform Adopts NVIDIA Tesla P100 For Next Gen Data Centers". ^ "Nvidia to Power Fujitsu's New Deep Learning System at RIKEN - insideHPC". March 5, 2017. ^ Tilley, Aaron. "Nvidia Beats Earnings Estimates As Its Artificial Intelligence Business Keeps On Booming". ^ Dean Takahashi. "Nvidia's Inception AI contest awards $1 million to 3 top startups". Venture Beat. Retrieved September 6, 2018. ^ "Six Startups Split $1.5 Million in Cash in AI startup competition". The Official NVIDIA Blog. May 10, 2017. Retrieved March 28, 2018. This page is based on the Wikipedia article Nvidia; it is used under the Creative Commons Attribution-ShareAlike 3.0 Unported License (CC-BY-SA). You may redistribute it, verbatim or modified, providing that you comply with the terms of the CC-BY-SA.